pointed out the above in the comments. I never thought of it as a romantic movie. It surprised me. When I think of The Terminator (1984) I think of guns and car chases. 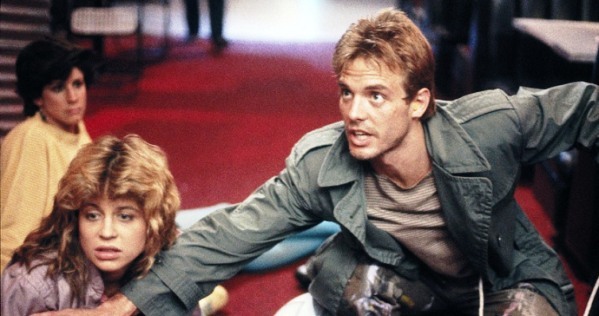 But the love story between Sarah Connors (Linda Hamilton) and Kyle Reese (Michael Biehn) is a powerful one. That made me think of other science-fiction, action and superhero movies that have a surprisingly effective romantic subplot. Time After Time and Source Code were suggested. Can you think of a movie that was surprisingly romantic? A movie that was either romantic in an unusual way? Or a movie that most people don't think of as romantic, but touched your heart? Guys, this is a great opportunity to score brownie points with your girl. Just put one of these on and look moved while you're enjoying the explosions. As with every Thursday survey I'll update this post next week with the best comments and suggestions. What about you? Is there a surprisingly romantic film you can think of? How about the 1990's Dracula? We still have a t-shirt somewhere that says "Love never dies." Even The Matrix had a love story to it. The upside-down kiss in the rain in Spider-Man was pretty romantic. And how awesome was that in Empire Strikes Back when Leia says, "I love you." and Han says, "I know." Which didn't Harrison Ford ad-lib that line? One of the most under-rated, under-watched time travel-esque movies (in my humble opinion) was The Butterfly Effect. No one went to see it because it has Ashton Kutcher in it and it's NOT a comedy. No one cared to see a serious Ashton. Personally I think he did a great job. But more than that, the plot was phenomenal. Couldn't tear my eyes from the screen, and the entire premise is ridiculously romantic, if also all kinds of tragic. (Warning: this is a very R-rated movie. As in DO NOT take your kids to it until you've screened it first. But as long as we're all cool with Terminator movies...:D) Great poll! Fun stuff to talk about! Love, LOVE The Terminator. And Michael Biehn is exactly why it outranks Judgement Day on my faves list. I think of The Fifth Element as romantic. Dallas and LeeLoo are incredible together. And Liesel is right about The Butterfly Effect. I also love Underworld Rise of The Lycans. I think that one is hellaromantic. Michael Sheen and Rona Mitra make me tear up. Weird, I know. The original Total Recall was romantic. Terminator is still a great watch. streets of fire... first to mind. Hitchhiker's Guide to the Galaxy. Some consider the overt romance between Arthur and Trillion to be one of its cardinal sins, but to me it's the element that makes the film great. I would also nominate The Adjustment Bureau.